BUY THE SET AND SAVE $2.00!! 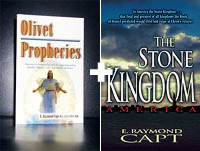 World renown Biblical archeologist and research historian E. Raymond Capt's latest book takes up the controversial and timely subject of end-times prophecy. The book is an edifying analytical commentary on the exhortations of Christ to His disciples on Mount Olive. Mr. Capt gives us his thoughts on the meaning of Christ's words to his disciples as he responds to their questions and concerns regarding what the future held and what it would be like at the end-times or "Last Days." Mr. Capt's latest book on prophecy. This is the long awaited companion to "The U.S.A. In Bible Prophecy". Stone Kingdom casts new light on the mysteries surrounding the Kingdom Parables of Matthew and the Old Testament.